The Belfast branch of Debenhams. DEBENHAMS IRELAND HAS moved to reassure staff and customers here that its operations will not be affected by the news that the British high street retailer has fallen into administration. The UK department store chain, whose history dates back to 1778, said in a statement today that its new owners will inject “significant” funding of £200 million into the struggling business. 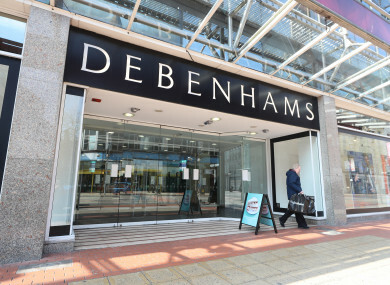 Debenhams plc, which has 165 stores across Britain and some 25,000 staff, appointed administrators FTI Consulting who swiftly sold it to a newly incorporated company controlled by its secured lenders. Debenhams in Ireland operated under a separate company, Debenhams Retail (Ireland) Ltd, following an examinership process in the Republic of Ireland in 2016. That process allowed the retailer to continue to operate 11 stores across Ireland employing 1,300 people. A spokesperson reiterated today that the position of Debenhams Retail (Ireland) remains unchanged and added that the five Debenhams stores in Northern Ireland are also unlikely to be affected. Debenhams plc had declined a last-gasp takeover bid from tycoon Mike Ashley, who owns sportswear retailer Sports Direct and had purchased collapsed department store chain House of Fraser last year. “It is disappointing to reach a conclusion that will result in no value for our equity holders,” said Debenhams chairman Terry Duddy. “However, this transaction will allow Debenhams to continue trading as normal, access the funding we need and proceed with executing our turnaround plans, whilst deleveraging the group’s balance sheet. We remain focused on protecting as many stores and jobs as possible, consistent with establishing a sustainable store portfolio in line with our previous guidance Our customers, colleagues, pension holders, suppliers and landlords can be reassured that Debenhams will now be able to move forward on a stable footing. They also face fierce competition from the likes of online sales. Email “Debenhams Ireland reassures staff and customers as UK store enters administration”. Feedback on “Debenhams Ireland reassures staff and customers as UK store enters administration”.